Do you know the pros and cons in the battle of sports drinks vs. energy drinks? Does your child? These two types of beverages contain very different ingredients, but many tweens and teens think they're the same thing—and that they have healthy properties, which is (usually) not true. Over a third of adolescents consume sports drinks and 15% consume energy drinks at least once a week, according to one 2014 study. Sports drinks often contain carbohydrates, minerals, electrolytes, and sometimes vitamins or other nutrients, along with flavoring. And yes, all of those (minus the flavoring) are part of a nutritious diet. But unless kids are exercising really hard, for a long time, they don't need to quickly replace those carbs, electrolytes, and water with a sports drink. Instead, they should consume them as part of their healthy daily diet, along with plenty of water. Energy drinks, on the other hand, contain stimulants like caffeine, taurine, guarana, and herbal supplements. Half of the $9 billion market for these drinks is kids, teens, and young adults under 26 years old, according to a 2011 study published by the journal Pediatrics. While some kids understand what ingredients go into energy drinks, many don't, and mistakenly think these beverages are a healthier alternative to soda or other sweetened drinks. Or they consume large portions of energy drinks in an effort to rehydrate after exercise, which leads to overconsumption of those stimulant ingredients. Caffeine is one of the biggest dangers of energy drinks. "Although the US Food and Drug Administration (FDA) limits caffeine content in soft drinks, which are categorized as food, there is no such regulation of energy drinks, which are classified as dietary supplements," note the authors of the Pediatrics study. Many energy drinks contain more than 3 times the caffeine of soda and have additional caffeine from additives such as guarana, cocoa, and kola nut. Kids and teens should not consume more than 100 mg of caffeine a day or 2.5 mg per kg of body weight. In 2010, the American Association of Poison Control Centers assigned a reporting code to energy drinks to track overdoses and other incidents. In Germany, which has tracked these incidents since 2002, such events have led to liver damage, kidney failure, seizures, respiratory disorders, heart failure, and even death. The authors of the 2011 study also raised specific concerns about energy drinks in certain groups of kids, such as those with heart conditions, ADHD, eating disorders, and diabetes. And they note that such drinks are often marketed to kids: "Energy-drink marketing strategies include sporting event and athlete sponsorships ... and product placement in media (including Facebook and video games) oriented to children, adolescents, and young adults." Other research has found links between energy drink consumption and behavior regulation, executive function, depression, smoking, and substance use. The primary problem with sports drinks is unnecessary calories. 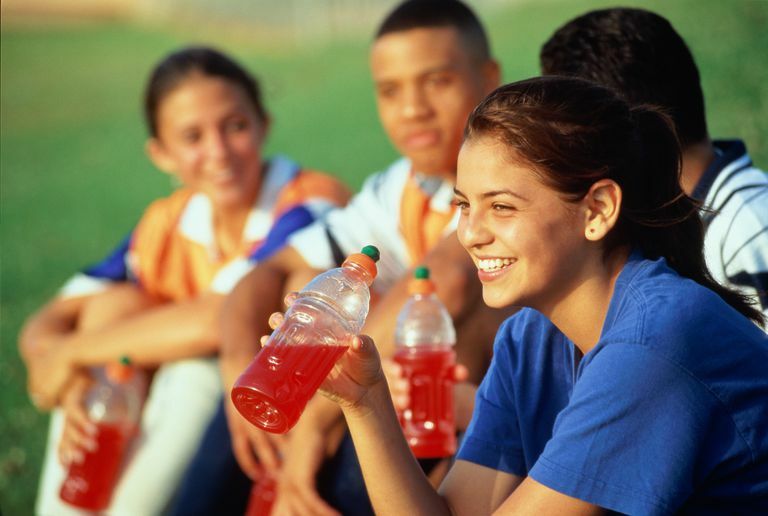 "For the average child engaged in routine physical activity, the use of sports drinks in place of water on the sports field or in the school lunchroom is generally unnecessary," says a clinical report from the American Academy of Pediatrics' Committee on Nutrition. It's easy to consume over 100 calories in one 20-ounce bottle of sports drinks without realizing it—especially when one bottle is actually 2.5 servings. Many people forget to account for serving size when reading nutrition labels and counting calories. "Excessive regular consumption of carbohydrate-containing beverages increases overall daily caloric intake without significant additional nutritional value," the report continues. "Therefore, frequent consumption adversely affects the appropriate balance of carbohydrate, fat, and protein intakes needed for optimal growth, development, body composition, and health." The bottom line: water is almost always the best choice for active, healthy kids. Committee on Nutrition and the Council on Sports Medicine and Fitness. Clinical report: Sports drinks and energy drinks for children and adolescents: Are they appropriate? Pediatrics Vol. 127 No. 6, June 2011. Costa BM, Hayley A, Miller P. Young adolescents’ perceptions, patterns, and contexts of energy drink use. A focus group study. Appetite No. 80, September 2014. Larson N, Dewolfe J, Story M, Neumark-Sztainer D. Adolescent consumption of sports and energy drinks: linkages to higher physical activity, unhealthy beverage patterns, cigarette smoking, and screen media use. Journal of Nutrition Education and Behavior. Vol 46 No. 3, May-June 2014. Seifert SM, Schaechter JL, Hershorin ER, Lipshultz SE. Health effects of energy drinks on children, adolescents, and young adults. Pediatrics Vol. 127 No. 3, March 2011.